Tonight's the annual Spoke & Food dining-out benefit - participating restaurants are donating part of tonight's dinner proceeds, and will be especially happy to see you arrive on two wheels! 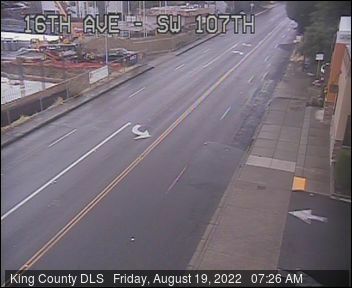 ... Read more..
Two meetings are set for the Seattle Department of Transportation to go public with how Roxbury might be made safer - dating back to the joint call a year ago ... Read more..
White Center Jubilee Days: Street fair, car show, parade today! Saturday, July 19th, 2014 Posted in White Center Jubilee Days, White Center news | Comments Off on White Center Jubilee Days: Street fair, car show, parade today! Biggest day of White Center Jubilee Days is today - and even if for some reason you're not going, you should be aware of the traffic effects. Today, according to ... Read more..
(The Steve Cox Park piano - photo courtesy Pianos in the Parks) If you weren't already planning to spend part of your summer at county parks - a public/private-partnership plan announced ... Read more..
Just a reminder - as of mid-afternoon today, the White Center Jubilee Days carnival is on, and at dusk tonight, it's the fireworks show. The carnival continues through Sunday; other ... Read more..
King County Elections is sending out ballots for the August 5th election starting today, and if you live in the North Highline Fire District, you will be asked to vote ... Read more..
Monday, July 14th, 2014 Posted in southgate, Sports, White Center news | Comments Off on Another information night for Southside Revolution Junior Roller Derby tonight! Southside Revolution Junior Derby was at West Seattle Summer Fest this weekend in hopes of recruiting skaters - and tonight's your next chance to find out about what's in store! ... Read more..
Monday, July 14th, 2014 Posted in Pets, White Center news | Comments Off on Do you know whose dog this is? From the inbox: "I found this little guy wandering around White Center at 107th and 18th Ave SW yesterday evening about 8:00 p.m. I took him to the vet and he ... Read more.. Announced this afternoon on Twitter: See what a few hours of patrol in White Center is all about. Follow me @KingCoSheriff starting a 5:30 today for a Tweet Along with a ... Read more..
(WCN photo from 2012) Announced today by Highline Public Schools: The Highline School Board unanimously approved a contract extension for Superintendent Susan Enfield at its regular meeting on Wednesday. Dr. Enfield’s contract ... Read more..
Less than a week until King County Elections sends out the August 5th ballots, which will include the North Highline Fire District benefit-charge ballot measure. Last night, meeting in West ... Read more.. The end of the 4th of July weekend is just the start of the rest of our summer. White Center Jubilee Days is just a week and a half away, ... Read more..
Not registered to vote? Monday’s the deadline! The August 5th election is just a month away - and it includes the important North Highline Fire District ballot measure. So don't miss the chance to vote - here's ... Read more..
A new incentive campaign for residential solar power is headed this way. Here's the announcement we received about Solarize Southwest: Solar energy is currently powering hundreds of Seattle homes, and residents ... Read more..
(Deputy Myers with a community art exhibit inside the WC storefront: WCN photo, March 2013) Out of the WCN inbox, from King County Sheriff's Deputy BJ Myers - he's leaving the ... Read more..